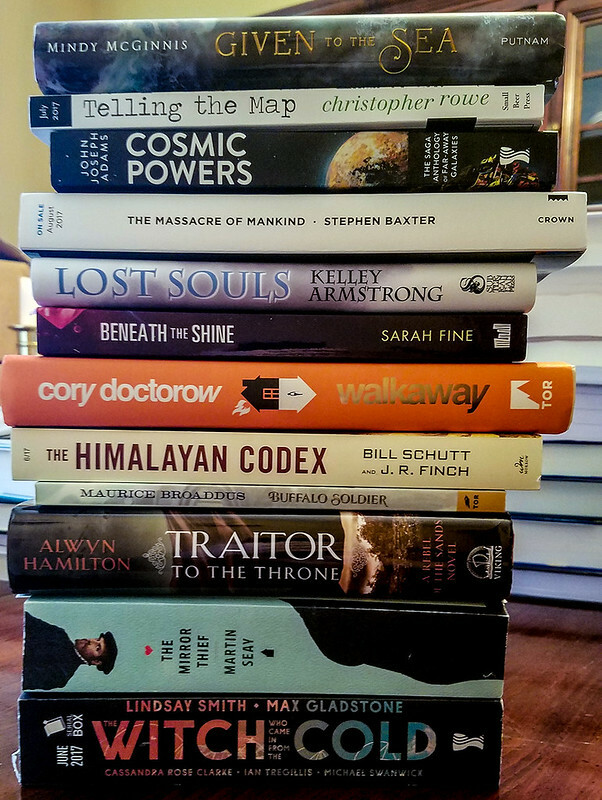 Before we get to April and all its shenanigans, here’s a final March stack of new books and ARCs to peruse. Find anything here you would want to take home with you? Tell us which ones in the comments! Because the announcement of the TV deal for The Collapsing Empire has people asking questions, let me quickly catch everyone up. Here’s where everything stands at the moment. I have four active options at the moment: The Collapsing Empire, Old Man’s War and Redshirts, and a project I can’t talk about yet (but which has been optioned and for which I’ve been paid). I have three other properties that are currently in discussion, which I also can’t talk about yet, but will when I can. Lock In was under option but isn’t now but could be again, hint hint, film/TV people. All the active options are at various stages in their development processes and it should be noted at any step in that process, a trap door could open up and swallow the project whole. The time to get excited about any optioned work making it to the screen is when you’re actually watching it on the screen. Until then, it doesn’t exist. Projects can literally take years to happen, even when they are actively being worked on. For these as anything, patience is a virtue. For those wondering if I’m actively involved in these projects, as a general rule at this point we negotiate me being an executive producer on the project. What this means can range depending on project, but generally means that I’ll be looking at scripts and offering other input. I’m open to writing or co-writing scripts, but often the producers already have people they like lined up for that. Generally speaking producers and studios like to play things close to the vest, announcement-wise, until there is actually something really big to announce (like greenlighting, principal photography, casting news, etc). Often I will have projects under option that I can’t announce or talk publicly about, because we follow the lead of the people who have secured the option. If I talk about something it’s because I’ve been given clearance to talk about it. I won’t talk about stuff I don’t have clearance for, although I might subtweet about how there’s a cool thing I know that you don’t. No, I can’t get you a job with the production. No, I can’t hire you to write the screenplay. No, I can’t help you get contacts with the production companies/studios I work with. This is especially the case if I don’t, you know, actually know you as a real live human being. No, please don’t send me screenplays/headshots/etc. I’m not responsible for any of those things. Also generally I don’t cast projects in my head until/unless they get to a point where producers ask me for casting ideas. Yes, I’m excited about each of these. I would love for one or more to be made and to be a huge hit. No, I will not become rich on film/TV options or at least not for a long time (they pay relatively little up front; the big money is on the back end). And yes, regardless of the success (or not) of any of these, I’ll still be writing the novels I have under contract for Tor. It’s why I have a contract. So that’s where everything is on film and TV deals at the moment. Not a lot of parking lot here. Hey, it’s downtown Chicago, you’re gonna get tall buildings. My event tonight: Volumes Bookcafe, at 7pm. It’s sold out! Thank you! But if you skipped getting tickets, uh, sorry. Next time for sure. 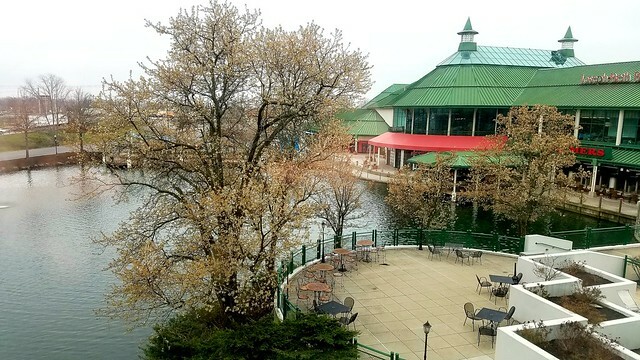 This is also the last View From a Hotel Window for about a week, because tomorrow I go home for a four-day break, in which I get to see my family, pets, bed and washing machine, and the next event is Monday, April 3, in Dayton, at Books & Co. No hotel then, I’m just driving in from home. I may write a couple of actual posts instead! Maybe! Or at least post a cat picture or two. We’ll see! 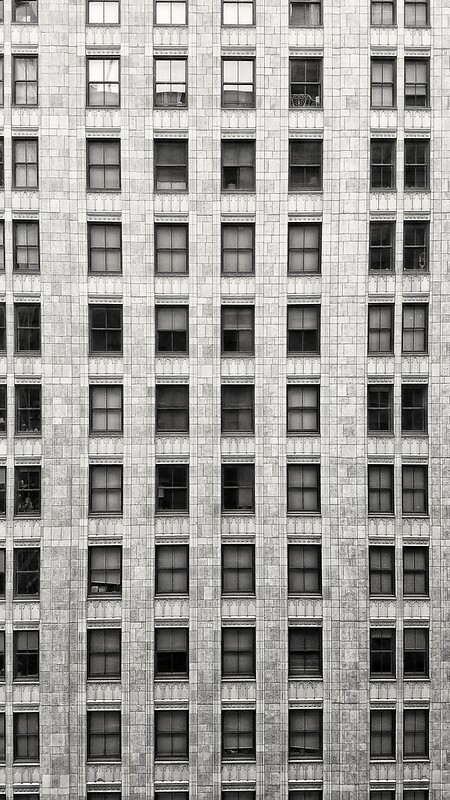 View From a Hotel Window, 3/28/17: Dallas! 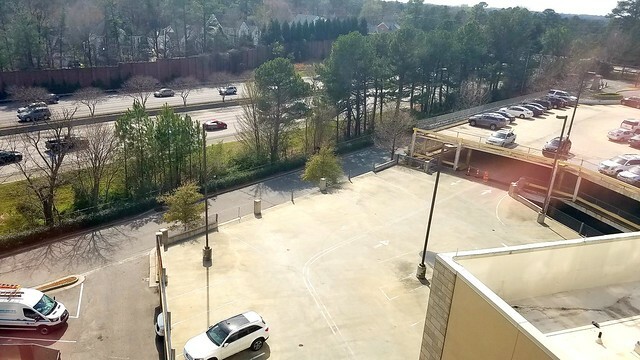 For the parking lot aficionados, bask in the glory of not one, not two, but three entirely separate parking structures! Parkingpalooza! That really catches us up on the parking lots, which had been a bit sparse the last few days. Also: Hello, Dallas! Tonight at 7 you can see me at Half Price Books! So do! I will be lonely without you. All of you. Every single citizen of Dallas. Yes. Tomorrow: Chicago, my collegiate stomping grounds! Volumes Bookcafe at 7pm. The event is sold out (yikes!). And then I get to go home for a few days. Wheee! Links for you today: A review of The Collapsing Empire at Ars Technica: The Collapsing Empire is a hilarious tale of humanity’s impending doom. And then, from me: Five Books I Was Thinking Of When I Wrote The Collapsing Empire. Enjoy! 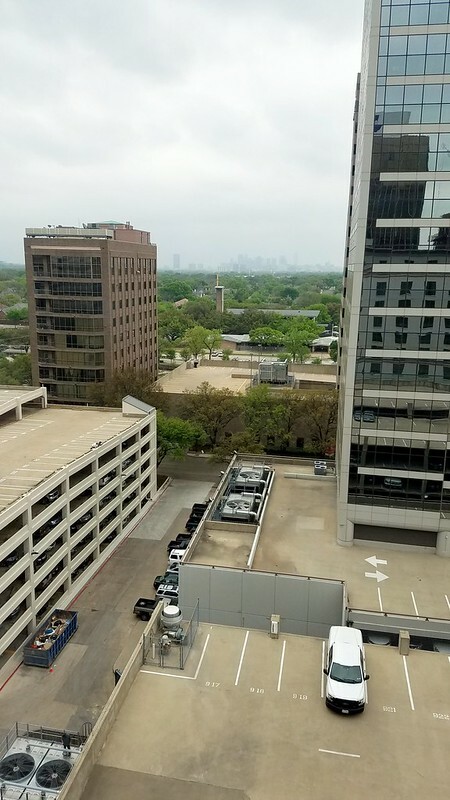 View From a Hotel Window, 3/27/17: Houston! Definitely not a parking lot. I could get used to this. 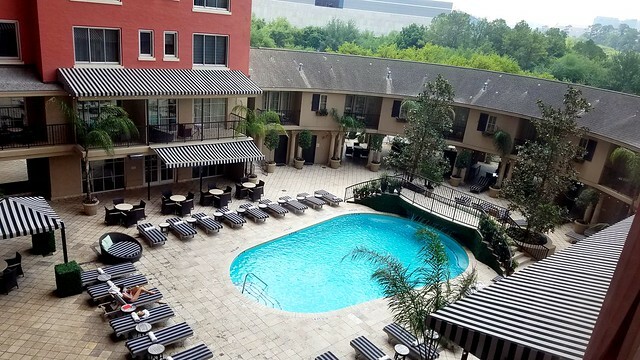 This is a fine time to answer a question I get sometimes about touring, which is whether I can any control (or say) regarding the hotels I’m in while on tour. The answer to this is that before the tour starts I make requests, not of hotels, but of what I’d like as my baseline for touring. In my case, I basically want three things: A decent bed, a viable internet connection, and not to be murdered when I exit the hotel. This gives the tour booker a lot of leeway, and I assume they then move forward with hotels they’re used to working with and/or hotels that fulfill a practical purpose (like, for example, being a short walk to the event venue). 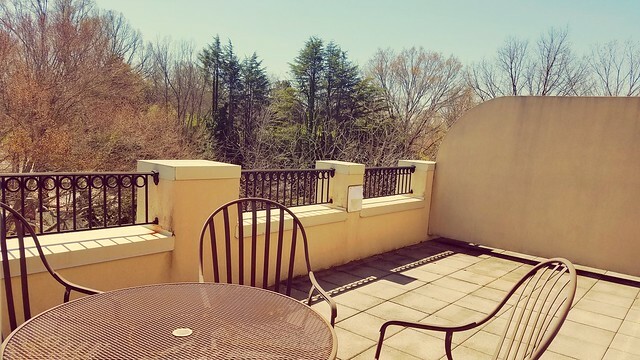 So sometimes I get a boutique hotel, like today, sometimes I get a something like a Marriott or an Omni, and occasionally I’ll get something like a Holiday Inn. And in all cases: Does it have bed, internet and no murders? Great! That’ll work for me. Also, I mean, I’m not paying for the room. From my point of view it’s all good. So, that’s how I do hotels (and flights). On an entirely different note, I wrote a piece about Seven Secrets to Writing a Best-Selling Science Fiction Novel. Just in case you were wondering. Finally: Houston! See you tonight, 7pm, at Brazos Bookstore. And tomorrow, Dallas, you can see me at 7pm at Half Price Books (the one at 5803 E Northwest Highway, which gets a full three compass points in the address). See you there! View From a Hotel Window, 3/26/17: Austin! I’m in a brand-new, very hipster hotel. I kinda love it, but I’m also very clearly not its primary demographic. Hello, Austin! In just about 90 minutes from the typing of this sentence, you can see me at BookPeople at 3pm! There’s still time to get there! Drive! Safely! Tomorrow: Houston, and a 7pm event at Brazos Bookstore. Come see me, please. I prefer not to be alone on tour dates. 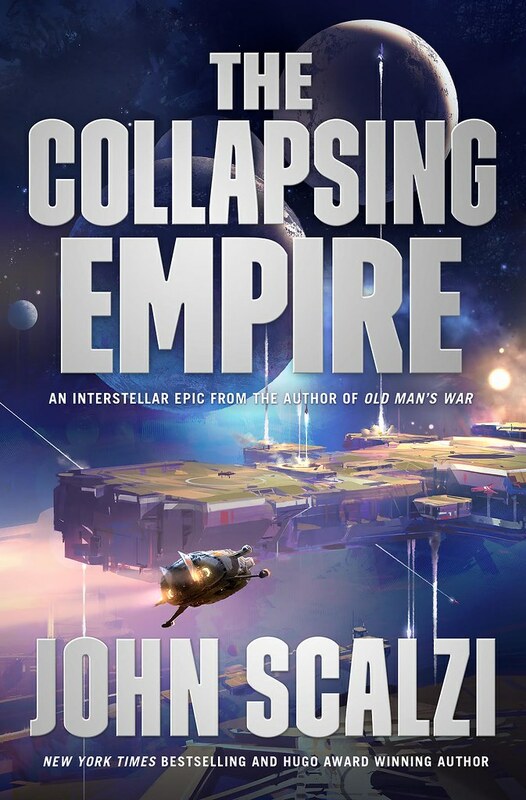 Been looking at the reviews (professional and otherwise) of The Collapsing Empire and I’m happy to say that by and large they’re pretty good. There are quibbles here and there, and from time to time someone bounces off it hard, but in both of those cases that’s fine, and to be expected, since no one novel works equally well for everyone. There has been one recurring comment about the book, however, that I’ve found interesting, which is that a fair number of people seem to think that it’s short; that is, shorter than usual for a science fiction book, or maybe a book of mine. Is it? Not really; it clocks in at about 90,000 words, which as it happens is about right in the middle for my novels (and a standard length for science fiction novels generally). The shortest novel of mine is Redshirts, which is about 55K words long (the codas add another 20K, which brings the entire book to 75k), and the longest is The Android’s Dream, which was about 115K. The Human Division, which is a collection of stories with a novel-like arc (we usually call it a novel to avoid sounding too precious about it) is my longest book of fiction, with 135k words. Most of the books in the Old Man’s War series clock in between 90k and 100k, and Fuzzy Nation and Lock In are both around 85k, if memory serves correctly. So, again, The Collapsing Empire is right around in the middle of my book lengths. I’m not entirely sure what makes people think The Collapsing Empire is short, but I have a couple guesses. One is that, like most books of mine, it’s heavy on dialogue and light on description, which makes it “read” faster than other books of the same length might be. The other reason may be that science fiction books, which anecdotally have tended to be shorter than fantasy books, are beginning to creep up in word count a bit. The Expanse books always strike me as pretty hefty, for example. While I never say never, it’s nevertheless unlikely my books are going to get much heftier than the 90K-110k word range. For one thing, all my books are contracted to be in that range. Yes, there really is a contractual length for novels, and a writer is generally supposed to come with 10% of the contracted word count on either side. So when I start organizing my novels in my brain, that’s the target I’m usually aiming for. For another thing, my heavy-on-dialogue, light-on-description general style doesn’t really lend itself to hefty tomes. I could bulk up my books a bit by adding more description of what characters look like (I’m sort of notoriously skimpy on physical description) or other such stuff, but it doesn’t really interest me to do so as a writer, unless I think doing so is relevant to the plot. My only real concern with people feeling The Collapsing Empire is short is that people then feel cheated, like they didn’t get enough story out of this particular novel. The good news for me, at least in the reviews I’ve seen, is that people don’t feel cheated, they just want more, soon. Well, provided I don’t get sucked into a jet engine or have some other tragedy befall me, there will be more, I promise. Relatively soon! And probably about 90k to 100k words long. 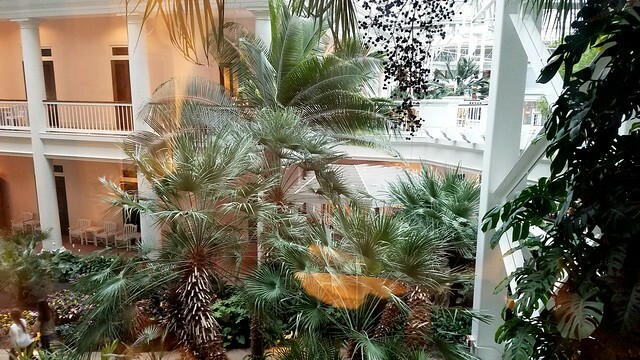 I’m staying at the Opryland resort, which is immense and filled with waterfalls and inside gardens and I feel very fortunate not to have lost my way to my room. Today’s event at Parnassus Books was really wonderful, and overall I have found Nashville delightful and have been very glad that I finally managed to get here. Tomorrow: Austin, and BookPeople, at 3pm (yes, another afternoon event). Please come see me! 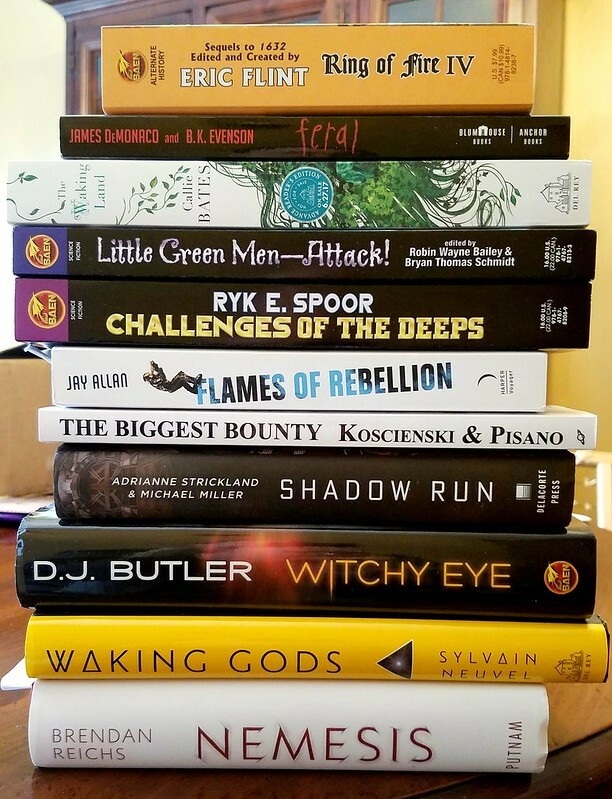 I may be on book tour, but that’s not reason not to show off a stack of new books and ARCs! What here calls to you? Tell us in the comments. You know, I lived in the Commonwealth of Virginia for four years, but in that time I never managed to get down to Richmond, its capital. I came here for the last stop of my very first book tour in 2007, and now I’m back, a decade later, and happily so. If you’re in or around Richmond, please come visit me tonight! I’ll be at Fountain Bookstore tonight at 6:30, and I would love to see you there. Nashville, you’re up tomorrow! I’ll be at Parnassus Books, early — 2pm (I’ll likely be coming there directly from the airport, in fact). See you soon! View From a Hotel Balcony, 3/23/17: Chapel Hill! Yes! I have a balcony this time! And it is lovely. I may go out and write on it. Being on tour has its occasional perks. I’m in Chapel Hill tonight, at the great Flyleaf Books, where the fun begins at 7pm. If you’re in the area, come on by and see me! 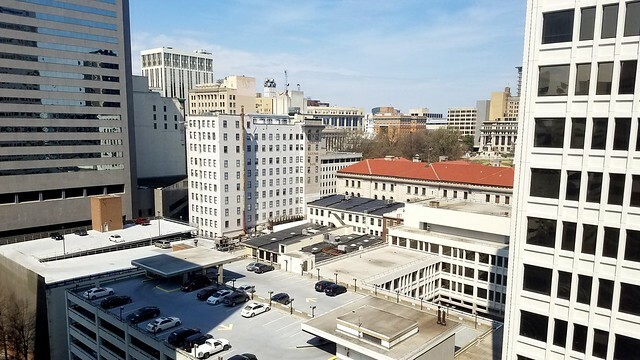 Tomorrow, I return to Richmond, VA for the first time in ten years (yikes! 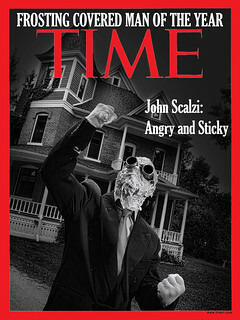 Where does the time go) at the Fountain Bookstore. If you’re near Richmond, I would love to see you there! Also, in this short entry I have used up all my all explanation points for the day! Chalk, by Paul Cornell, is in many ways a remarkable book. But it’s not an easy read, and for Cornell, it’s a story that has personal meaning for him, and is a book that has a lot of him in it. He’s here now to tell you more about it, and why as a writer it took him years to get this story right. Chalk is a book that’s been with me for over twenty years. It’s taken that long, and many, varied drafts, to shape the ideas in it into a story that, hopefully, works. That was partly because the subject matter is intensely personal to me in several ways. It’s a book about bullying, about growing up in the 1980s, about Wiltshire’s prehistoric landscape, so often I found myself having to force onto the page material I had found difficult to express in real life. It’s a novel about the interaction between magic, consensus reality and the mind (Isn’t ‘consensus reality’ a strange term, when actually what’s involved is the opposite? A simple majority doesn’t make a consensus. Nobody experiencing a different reality seems to get a vote. For a lot of people, ‘non-consensual reality’ would be closer to the truth). In the real world, it seems to me that every time the impossible touches the accepted it’s a singular event, something so strange and startling that human efforts to categorise those events (crop circles; the UFO myth; ghosts) have come to feel to me to be missing the point to an almost obscene degree. We encounter the unknown and seek to make it mundane. Which is a different thing to seeking to understand it. So I wanted my story of Waggoner, a child at school who has something terrible done to him, and then has horrifying things from both this world and another take an interest in him, to be rooted entirely in his subjective experience. Waggoner is split into two boys, both with his name, who live alongside each other. I want to underline that that’s not a metaphor, not a literary device, or if it is, only in the same way that all magic is. The book says it ‘really happened’. The way that reality contorts and fudges things to let the second Waggoner be there is an aspect of the text I feel very strongly about, because I feel, again, that’s how the impossible touches the everyday, on a moment by moment basis, not by laying down a set of rules for itself and keeping to them. That’s physics, and/or fiction that seeks to fulfil different expectations than this book does. ‘Are you an evil twin?’ Waggoner asks the other version of himself at one point. But he’s not. He may be the one who does awful, violent things, but the Waggoner who narrates the story isn’t ‘the good one’. Waggoner tries to make sense of what’s happened to him through writing his own stories, and sometimes imagines what he’s going through to be a revenge plot, with the possibility of victory over his tormentors, but it’s not. It’s a lot harder on him than that. 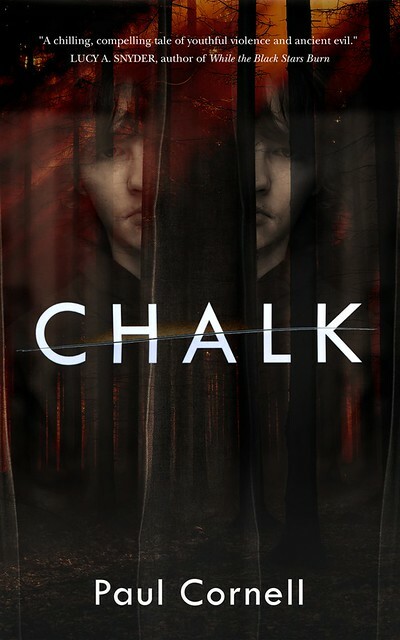 Chalk is a book about cycles of abuse, and as a victim, Waggoner’s only possible heroism is in seeking to break those cycles. That point, that there’s no nobility or ending to anyone’s narrative in acts of revenge, has been at the heart of these twenty years of multiple drafts. It’s a hard thing for me to force myself to accept. In many ways, Chalk is a book about whose narrative wins. The new Waggoner has aims which are part of a great and noble story of heroism and struggle, and are as horrifying as that sounds. The previously whole Waggoner has the stories he writes, which use every genre he can find in his environment to try to digest what he’s dealing with. Angie Boden, the heroine of the book, has created for herself a whole method of practical magic from the pop charts, and her narrative of the world is based on that. And Waggoner’s Mum and Dad are trying to tell a meaningful story of themselves as failing middle-class people in Thatcher’s Britain. I’m in there somewhere. I’ve decided it’s a very bad idea to indicate how much of Chalk happened to me. If you’re a fellow survivor of, well, virtually anything, I hope it’s a book which leads you along through a narrative that will wake all that stuff and then slay it. It’s the blues. It’s comfort through reworking. I hope it gives you control. I know you don’t want revenge, not really. Not when you look around and see all the revenge narratives unfolding everywhere. Who would have thought it would take me twenty years to write a book about right now? 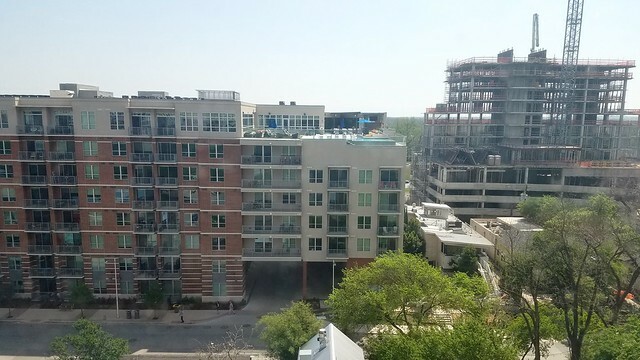 View From a Hotel Window, 3/22/17: Raleigh! Ahhhhh, there we go. Parking lot excellence. If you’re in or around Raleigh tonight, I’ll be a Quail Ridge Books at 7pm, in its spiffy new location. Come on down! In the Research Triangle but can’t make it tonight? I’ll be at Flyleaf Books in Chapel Hill tomorrow. See me then! For everyone else not in the area, two interviews with me, talking about The Collapsing Empire and other topics: One at The Verge, and the other at The Chicago Review of Books. Get inside my head! Mind the low beams. Here’s the thing about ghosts: Nearly all of them have one thing in common. 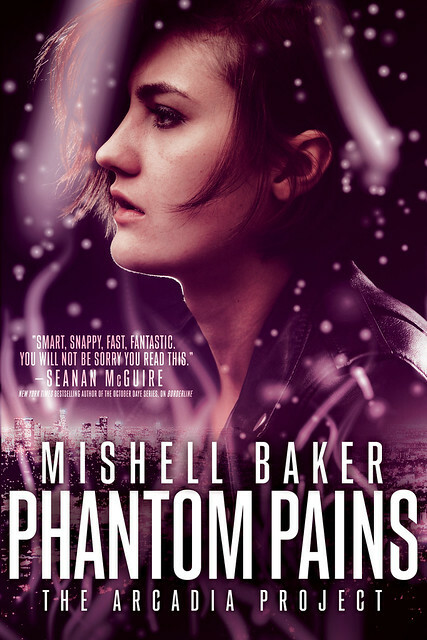 Or so author (and current Nebula Best Novel Award finalist) Mishell Baker believes. In today’s Big Idea, she tells you what that thing is, and what it means for her new novel Phanton Pains. Long before I began writing stories about a young woman with two lower limb amputations, I was intrigued by the phenomenon of phantom limbs. The idea that a part of your body could stab you with pain from nerve endings long gone, leaving you no way to soothe what was no longer there, struck me as both fascinating and nightmarish. While my protagonist Millie isn’t troubled by this particular malady in a literal sense, I couldn’t resist finding ways to haunt her with it both supernaturally and psychologically. The Arcadia Project books are all as much about mental health as they are about magic, and often about the way those two things interact. So in Phantom Pains what I wanted to do was take two alternate forms of metaphorical “phantom pain” – grief and ghosts – and see the ways in which the fuzzy edges of these concepts bleed together. Nearly every ghost story involves grief, or at least a grievance. Spirits don’t tend to hang around on this plane if they have all their problems resolved. But unlike an angry monster, a wrathful or grieving spirit has no obvious remedy. This has always been my favorite part of a ghost story: the quest to discover how to defeat a foe that swords, fire, stakes and poison can’t touch. A foe that nothing can touch. Every ghost story is a detective story, which is why ghosts lend themselves so well to urban fantasy, a type of fantasy that so often has one foot deeply planted in the mystery genre. Before you can rid yourself of a hostile spirit, you have to understand it. Blind stabs can’t kill something that isn’t there. In a similar way, every story of grief involves a ghost. The loss of a person, a job, a way of life is a messy thing to heal, because every moment in your life is so strangely full of, haunted by, that new emptiness. I attended Clarion in 2009, and one of my classmates moved just a couple of streets over from me in Los Angeles not long afterward. We saw each other a couple of times, but mostly I’d just tell myself, “Oh, I should go see Leonard. Maybe next weekend.” In 2012, a few months after my second daughter was born, Leonard was diagnosed with leukemia. He was going to be fine, they said—they’d caught it early. But I still made myself leave my brand-new baby and go visit him in the hospital. I’m glad I did, because the next day he surprised all of us by dying. The worst part of the grief that followed was that my brain kept throwing that old habit at me: “Oh, I should go see Leonard. Maybe next weekend.” That option had been taken from me now, severed cleanly and unexpectedly, and yet my mind still kept trying to put weight on it. Every time I reached to soothe that guilt with a mental promise to myself that I’d go and visit, there was nothing there to follow up on. No way to ease the pain. I’d been given all the visits I was ever going to get, and I had to live with that. Anytime we battle the invisible, whether it’s a ghost or something that haunts us psychologically, the only weapon is investigation. Find the source of the pain and hold a mirror to it, create something real and tangible that you can fight in its stead. For physical phantom limb pain, the answer is often a literal mirror. If the amputee holds a mirror in such a way that they can now “see” the missing limb in the proper spot, this is, in many cases, enough to make the discomfort vanish. What would the equivalent be, I wondered, for the invisible enemy in my story? What supernatural equivalent of a mirror could be held up that could force the invisible to become visible, to bring the hidden into the light where it could be vanquished? This question is at the center of the story, because our heroine—who is also suffering the “phantom pains” of grief, guilt and PTSD from the deaths in the last book—is one of the few to whom this lethal invisible enemy has deigned to show itself. She has very few allies in the fight, because the people in charge have every reason to believe that she’s either flat-out lying or crazy. I had a fantastic time weaving together the themes of grief and ghosts in this story, because in addition to being creepy and cool, it also had tremendous personal meaning for me. Especially for those of us with mental health challenges, many of the battles we fight in life are invisible. I liked the idea that a battle doesn’t have to destroy a city block in order to be earth-shattering—that sometimes the fate of the world might literally be all in your mind. That said, in fiction, you’ve always gotta explode something, or someone, right? Otherwise, where’s the fun? View From a Hotel Window 3/21/17: Lexington! And it’s not of a parking lot! I take that as a good sign. Tonight I’m in Lexington, Kentucky, one of my favorite places, at Joseph-Beth Booksellers, which is one of my favorite stores. The event starts at 7pm and this audience gets to be to guinea pig, because I’m reading everything here for the first time ever (uh, except one thing, which I’ve only read once before). If you’re near Lexington, come on by. Tomorrow: Raleigh, North Carolina! Thursday: Chapel Hill! Yes, a North Carolina twofer. See you soon! The Collapsing Empire is Here! Hey! It’s out! The Collapsing Empire, my twelfth novel, is here and available at your favorite bookstore and/or online retailer (in the US/Canada; in the UK it’s out in two days). It’s the first book in the new space opera series (called “The Interdependency”) and introduces some of my favorite characters ever in a universe I think you’re going to love. You can also get signed copies! 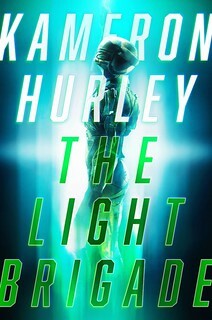 It’s also out in audio, with narration by Wil Wheaton, from Audible. Plus, I am on tour, starting today, beginning in Lexington, Ky. The full itinerary is here. Come see me! I’ll be reading new material plus other stuff, and as always will torture you with a song if someone brings a ukulele (and someone almost always does). This book means a lot to me, folks. This is the first book in that 13-book contract I signed with Tor a couple of years back; this book is significant not only for itself, but for being a launch project that that particular long journey with my publisher. I wanted to start it off with something new and fun and good, and I really think I have. I can’t wait for you read it. Hey there! Wanting to have me deface a copy of my upcoming book The Collapsing Empire (or other books of mine), with my signature, and possibly a personalization? Here are all the ways you can make this happen in the next few weeks! 1. Come see me on tour between March 21st and April 29: Yes, it’s a long tour, with two dozen stops over five weeks. Which means there’s a reasonable chance I will be (somewhat) near you. Why not come see in person? I will be reading from the upcoming book (Head On, the sequel to Lock In) and will have other entertaining bits going on as well. And I will sign your copy of TCE while you are there! And other things you might bring. Here’s the tour schedule. Note that some events are ticketed; go through the links for details. 2. Pre-order the book from the stores on my tour: If you can’t make it to one of my events but feel like supporting the stores I’m visiting, call them up, order the book from them, and ask them to have me sign it when I’m there for the event (important note: ask for that before the date I arrive for the event, not after). They will generally be happy to take your order, have me sign it, and then ship it to you, for their usual shipping fee. I will also generally be signing remaining Scalzi book stock on the tour, so even if you call after I’ve gone, they still may have signed stock. 3. Call Jay and Mary’s Book Center in Troy, Ohio: I am signing their entire Scalzi stock today before I go on book tour, so you can call and they’ll set you up. Additionally, even if they run out of signed copies immediately, if you’re willing to wait to have me sign your book until I’m back in town (which during the tour happens March 30 – April 2, and April 9 – 16), you can still order from them and I will both sign and personalize your copy. 4. Check with Barnes & Noble: I signed a whole bunch of signature sheets for them earlier this year, which were put into copies of the book. So your local B&N might have them on the shelf. They’re also selling them online. 5. Try an airport bookstore: As I’m slogging through the airports of this great nation of ours whilst on tour, when time permits I’ll pop into their bookstores and sign stock (with their permission). When that happens, I’ll probably note it on Twitter. But otherwise, particularly in a hub airport, just check out the bookstore (which you should do anyway). There might be a signed book! 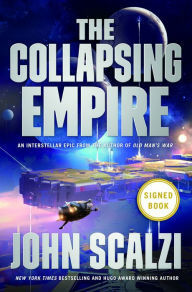 And there you go — signed copies of The Collapsing Empire. Go get ’em. 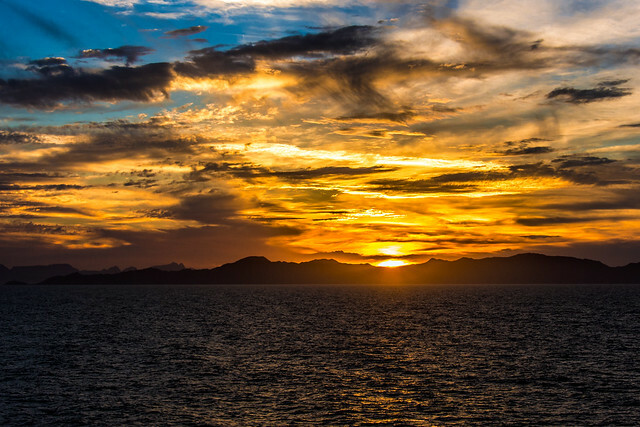 The sunsets around the Scalzi Compound have been a bit uninspiring recently, so let me offer you this one, from Baja California, on March 8. I think it’ll do quite nicely, don’t you? Stop, thief! 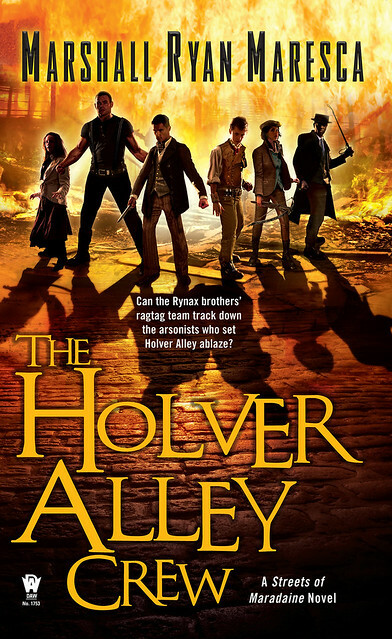 In today’s Big Idea, Marshall Ryan Maresca explains why actions we wouldn’t approve of in real life we enjoy in fiction, and what that means for his new novel, The Holver Alley Crew. It’s fascinating how much we love the thief-as-the-hero trope, and we love having them pull a heist. I mean, in real life, we don’t praise thieves, and we certainly don’t root for them. I’ve been wracking my brain trying to think of any living thieves that we have romantic notions for. We certainly romanticize the thieves of the past: Jesse James or Bonnie and Clyde, but that’s with a distance of history that makes them almost fictional. And we love fictional thieves. From Oceans 11 to The Lies of Locke Lamora to Six of Crows to The Fast and the Furious, we can’t get enough of bad guys doing things well. We love to see stories about thieves pulling some heist or caper, slipping through the fingers of the proper authorities, and heading off into the sunset with their ill-gotten wealth. Why do we love it, when most of us would never support this in real life? Do we want to live vicariously through them, getting away with things that we know we would never get away with? Do we harbor secret fantasies along the lines of, “I would never actually rob a casino… but if I did, this is how”? I’m no different, because I love that stuff. So I wrote The Holver Alley Crew, which is flat-out a fantasy heist novel. Two brothers have a job, so they put together a crew, and they pull the job. Absolutely, my favorite part of writing this book was coming up with the plans. I loved writing whole sequences of the characters going, “Here’s what we want to accomplish, what do we need to do?” I loved coming up with elaborate, “here’s our way in, here’s how we do this, here’s how we get away” plans. Then I threw wrenches into the works to ruin those plans, so my characters would have to improvise new ones. I feel part of our love affair with charming thieves and clever rogues we want to believe that if we had to be thieves, if we had to pull a heist, we’d have the smarts and the moxie to pull it off. But we wouldn’t do it just because we had a passing whim. We would only do it because we had to. Only because circumstances made us desperate. I think we can all understand desperate right now. It was important to me to make my heist-pulling thieves good guys who want to be law-abiding, legitimate businessmen. But then a fire comes along and destroys all they were building: home, shop, legitimate life. With that lost, they have to go back to pulling heists, and they make a point of putting together a crew of people who were also ruined by the fire. It’s not about just getting back on their own feet, they want to help their neighbors as well. Just enough to get themselves back on the straight path they were on. The Driver: Kennith Rill, carriage driver. Designed an unrobbable carriage, which they now have to rob. The Apprentice: Mila Kentish. Teenage beggar girl that no one notices until after their purse is already gone. The Old Boss: Josie Holt, the boss of North Seleth, who’s willing to give the Rynax boys one last chance for old time’s sake. Can this crew pull of their heist, charm your socks off and ride off into the sunset? You’ll have to read it and find out.